Andre Russell enroute to his quick fire of 66 off just 36 balls. The Kolkata Knight Riders scraped a 4 wicket victory against the heavyweights Kings XI Punjab in an absolute engrossing and sensational encounter. With half the team out, the Knight Riders seemed to have apparently lost the match, but it was Andre Russell who came out all guns blazing and helped his team cross the line for a memorable victory. 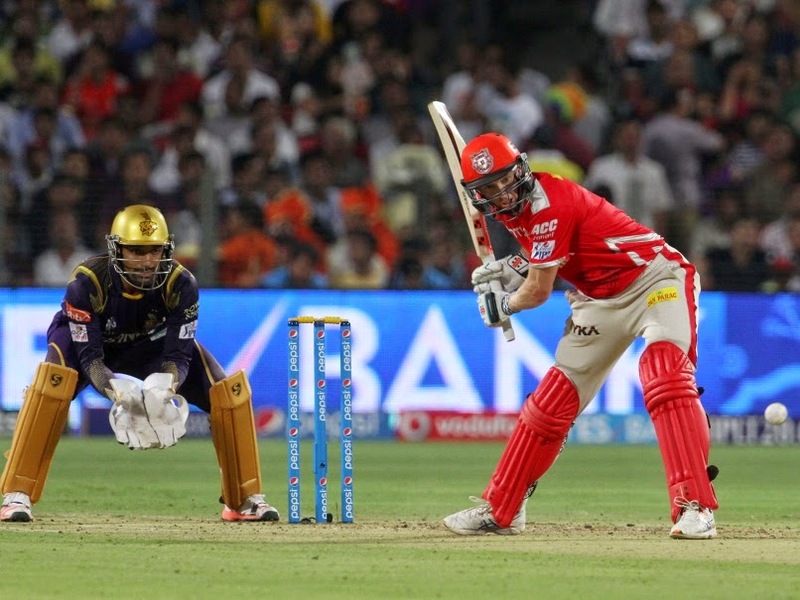 Dropping out David Miller cost the Kings XI as they fell fifteen to twenty runs short batting first, while on the other hand bringing back Umesh Yadav to the side clicked for the Men in Purple. Winning the toss and inviting the hosts to bat first, the Knight Riders were right on the money. Umesh Yadav struck for his team in the very first over, removing Murali Vijay courtesy to a brilliant low catch by Andre Russell, as Punjab were 0-1. This was not it, as the Knights continued their disciplined bowling the result of which was the fall of two back to back wickets in successive overs. Wridhiman Saha departed in the 4th over hitting a ball off Morkel into the slip and was followed by Sehwag in the next over who was sent back by Chawla as Punjab were reduced to a mere 27-3 in just 5 overs. Umesh Yadav, who delivered it with the ball for his team, celebrates a wicket. The initial blows brought Maxwell and captain Bailey to the crease, who had nothing short of an uphill task ahead. Maxwell showed some resistance by clearing the boundary like his usual nature and was also given a life by Yusuf Pathan who dropped his catch. As soon as he was starting to explode and look dangerous, Umesh Yadav peaked at the right moment and claimed Maxwell's wicket who walked back for 33 runs. As George Bailey stood at one end looking quite decent and hitting the ball easily, wickets kept falling at the other end. Perera gave away his wicket and Gurkeerat who had hit a six and is known for is hitting, too returned leaving their team in an absolute state of trouble. Bailey was also finally run out in the last over and was the highest scorer for Punjab, amassing 59 runs in just 44 balls. George Bailey anchored the innings to help is team put up a modest total to defend. The Knight Riders put up a disciplined and effective bowling show, picking up wickets periodically and restricting the opponents to 155 for the loss of 9 wickets. Bringing back Yadav reaped profits for them who picked up 3 wickets. Morkel too looked good grabbing 2 wickets and giving away just 27 runs in his quota of 4 overs. Narine claimed a wicket and controlled the run flow, while Russell earned two wickets for his team. Chasing down a total of 156 runs would have been relatively easy, but it turned out to be an absolute thriller. The Knights lost their first wicket in the form of opener Uthappa early in the 3rd over due to a lbw by Sandeep Sharma. Soon, Mansih Pandey too had to take the long walk back, with Sharma yet again doing it for Punjab.Suryakumar Yadav known for his power packed hits all over the park, did exactly what one expects from him but he also had to return after nicking a ball of Perera which landed in the keeper Saha's gloves. 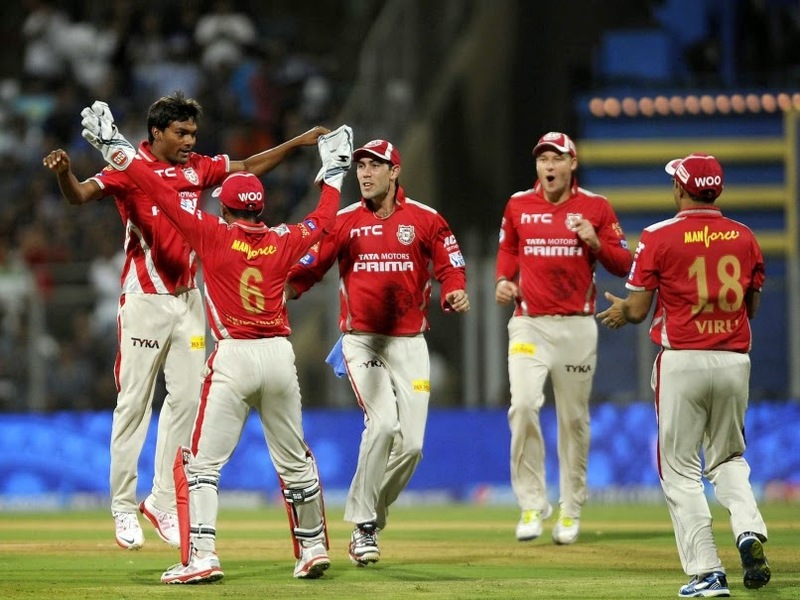 Sandeep Sharma, glittered for the Kings XI Punjab, claiming four wickets. The Knights already looked in trouble, but Sharma added more to their woes making the skipper Gautam Gambhir and Ryan ten Doeschate his preys on two successive deliveries and thus reducing the Knights for a troublesome 60-5. It seemed that the Kings had very much turned the match in their favour, but if the Knights really wanted to triumph they needed nothing short of a miracle. However, just like any other Twenty20 game, this contest too had something special to offer. The surprise came for the Kolkata fans in the form of the West Indian all rounder Andre Russell who along with Yusuf Pathan played an innings which will be remembered for a long, long time to come. He emerged as the Knight with a shining armour, taking charge on the bowlers and scoring a half century in just 28 balls. Much to the disappointment of Punjab supporters, the Knight Russell renamed a Punjab victory in their favour and even luck supported him as he was dropped by Maxwell when a wicket was what Punjab required the most. Russell played a belligerent knock of 66 runs in just 36 balls and created a match winning partnership of 95 runs along with Yusuf Pathan. He got out when just a run was required, as the Knights sailed home with 2 overs to spare. 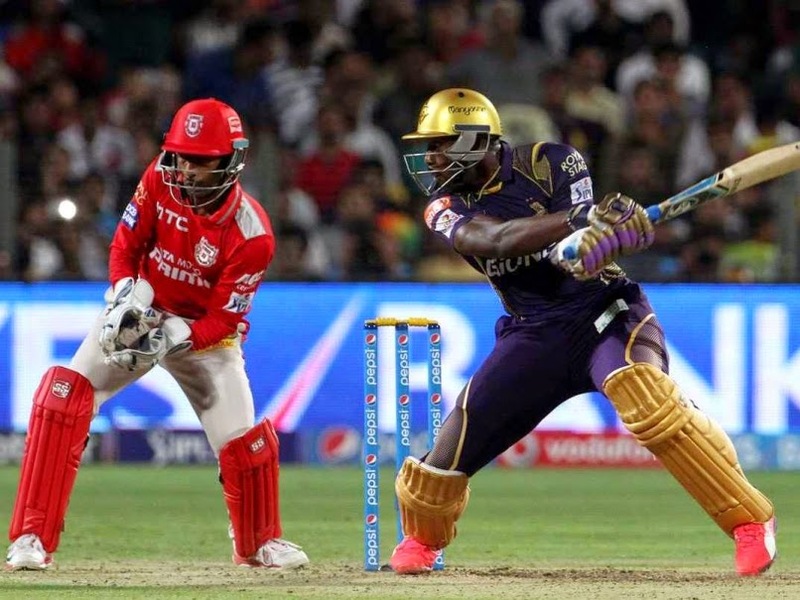 Andre Russell was named the man of the match for his 2 for 39 and a marvelous knock of 66 runs in merely 36 deliveries. In this defeat of the Kings XI, a star that shined was young gun Sandeep Sharma who bowled a quality spell grabbing four important wickets. Now, all that Punjab require is clear discussion of their strategies in both the departments. Their batting which boasts of match winners collapsed today, which might be a cause of worry for them. Even their bowling apart from Sharma was not impressive and so they need to mend their ways before its too late. While on the contrast the Knight Riders will be quite satisfied pulling off an all important victory and would look to carry the momentum forward, working a bit on their batting department which could have been the reason for their loss today had Russell not fired. The Kolkata Knight Riders play the Delhi Daredevils next on 20th April, while the Kings XI Punjab play the Rajasthan Royals who are on the pinnacle of the points table, at the moment. Kolkata top Kings XI Punjab.